The search bar has moved to the top left corner of the page. You can find all the old posts here by simply typing in key words and searching. 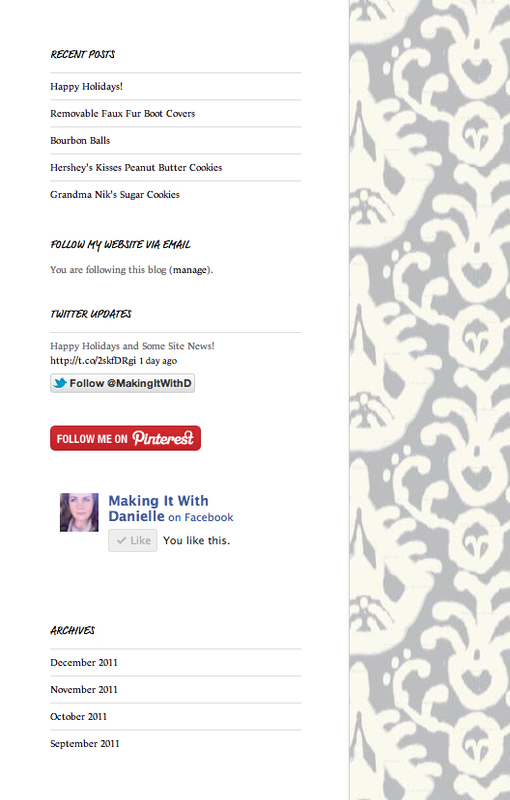 The header of the page has stayed the same… If you click on the “Making It With Danielle” text, if will take you to the home page. The menu underneath that text allows you to choose a category and browse previous posts as well as get info about the website and the ability to contact me. The side bar has changed a bit as well. At the top you’ll find a recent posts section.. this will include links to the last five posts I have done on the website. Underneath that are all the different ways you can follow me. Sign up for email alerts to receive an email when there’s a new post. Follow me on twitter and your timeline will have a tweet linking you to the newest post. “Like” the Website’s Facebook page and get access to photo albums and updates. I’ve also opened a Pinterest account so follow me on there and be sure to “Pin” the things that inspire you. The last thing on the side bar is the website’s archives, divided up by month… Click on the month you want and you’ll be able to browse all the posts for that time period. These will be in abbreviated form so just click on the headings to open the full post. Aside from that, everything is pretty much the same. The posts will look slightly different, just because of the new format. You can still comment at the end of each post but there’s also a shortcut in the text at the top left corner of each new post. The pictures will be a little smaller too because of the new format. To view any of the pictures in their full size, simply click on them and it will open up in a new window. I am really excited about the new look and have my mother in law to thank for it, the upgrades were her Christmas gift to me! Hope everyone enjoys the new site and continues to be inspired by it. Leave a comment in the box below and let me know what you guys think of the new look!